It was rather heart wrenching to rip it all out. But I must say I was more than half expecting to need to. I learned a few things from knitting it, so it wasn't a total loss, and I am going to be starting it again. I did a better test swatch this time, and by going up a size in the needles, got a match to the gauge, without having to heavily block it out like I did the other one. The other thing I learned from the first time through, was that I didn't like the way the pattern said to finish the neck. 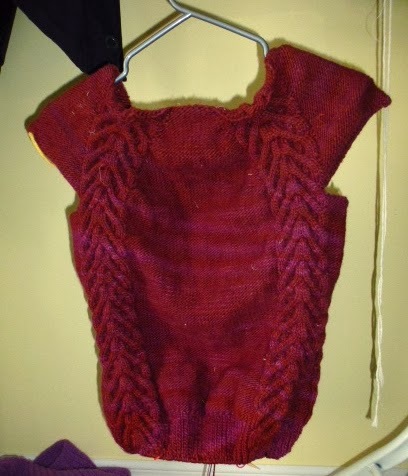 So when I start it the next time, I'm going to do a ribbed neck before getting to the body of the sweater. 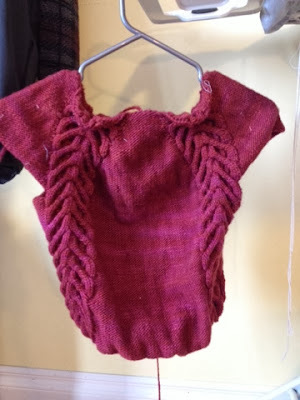 They called for an icord neckline, which I didn't like. The first time, I picked up the stitches and knitted a ribbed neck, and like it, so, rather than having to pick up the stitches for doing the neck, I'll do the ribbing right from the start. In the meantime, I'm working on socks. I have the pink one, where I'm ready to turn the heel. And then, just because I was discouraged from having to rip out the sweater, and wanted something a bit more interesting than the pink sock, I started the white with the fun colours in it, just to see what it would look like. It's getting an interesting distribution of the colours stacked one on top of the other. That might change though, once the ribbing is done. If it doesn't, I might rip it out and add a couple of stitches to see if the colours will separate out a bit. But, then again, after looking at it closer, it's kinda neat just the way it is. I did it!! 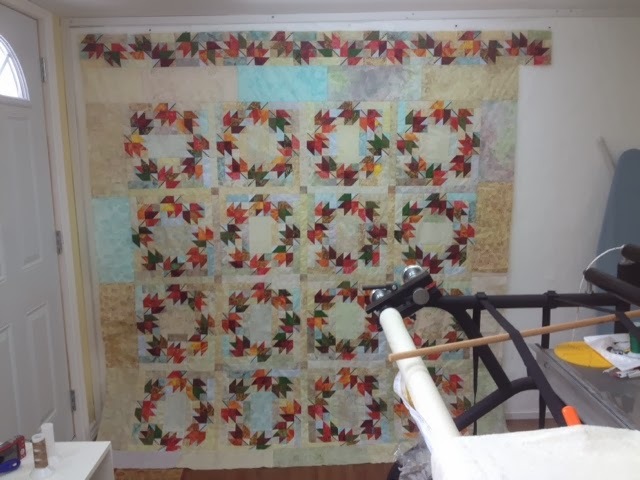 I made my goal of getting my Thanksgiving Leaves quilt finished for the end of January. It was this month's UFO, and it is done!! I really wish I could get a better picture of it. But with the weather still so cold and windy, there is no way to take it outside for a photo shoot. This time, rather than hanging it from the upstairs landing, I tried Matt and Becca's kitchen floor. It's a pattern by Judy Martin, found in her book Patchwork Among Friends. I'm linking this finish up to A Lovely Year of Finishes. I already have a good idea of how I want to quilt this, so it might end up the next one of mine to get loaded, when I get a spot open for it. I had to take a break from working on Three of a Kind, a pattern also by Judy Martin, found in her book Scraps, in order to get that UFO for January finished. I can now go back to working on it for the last couple of days of the month, before I decide which UFO is going to get pulled out for February. I need 36 of these blocks for the queen sized quilt, so I'm halfway there. I'm going to keep working on this one until it is done. That's my bargain with myself. A UFO finished each month, and any new starts have to be finished, unless they are block of the month type, of course. 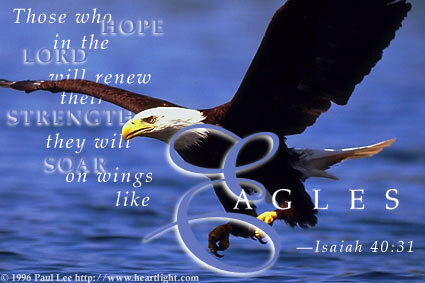 I'm linking up to the Canadian Needle and Thread Network for their Work in Progress Wednesday. There is lots of fun stuff to see there, and it's great that they are Canadian. And while I'm at it, I'll link up to Freshly Pieced WIP Wednesday as well, where there is even more stuff to see from all over the world. This isn't a design wall so much as a design balcony landing. There was no place else in the house big enough to hang this thing from. It is huge, and has one more set of borders to go on. It's just a 2 inch outside border, so that won't be too bad. I have some of the blues left, so I think much of that outer border will be various blues. That might help the blues that are in that wide inner border fit in a bit better. This is my job for tonight, to get the last of the borders onto this beautiful monster of a quilt. This was my UFO assignment for January, so, unless something unexpected happens, I will be able to cross this one off the list. It will be somewhere around 100 inches square when finished, although that will shrink up a bit with quilting. Maybe, by the time this is done, the warmer weather will be here and I can get the next picture of this outside where there is much more room, and much better light. I'm linking up to Judy's Design Wall Monday. What an incredibly lazy day this has been today. It's cold and it's snowing, and I don't really feel like doing anything, or going anywhere. I've spent a lot of it so far just blog surfing. There really hasn't even been that much stitching done today. I finished sewing down the small heart, and that's it. I've been spending some of the day prepping the next set of pieces for My Tweets block nine. I forced myself to do the beak and the top knots while I was doing the rest of this bird, rather than putting them off until later like I usually do. I'm doing the tails of the birds differently in each of the blocks. At some point before doing block 10, which is safely several weeks away, at least, I am going to have to put them all on the wall and make sure I haven't got too much of any one colour going on in the tails. 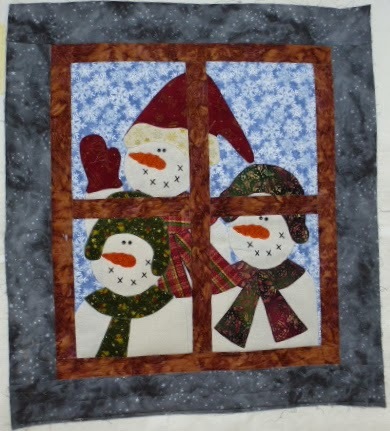 There's lots of other lovely hand stitching projects being shown over at Kathy's Quilts. There was more stash out this week, although not a lot, and still none in. Four weeks into the new year, and I haven't bought fabric yet! Balance: 11.4 more yards out than in. I'm linking up, as usual, to Judy's Stash Report. flashes, so there are several quilts on the bed. My very scrappy Endless Chain, from a pattern by Emilie Richards and the Double Duty, a pattern by Miss Rosie's quilts. Jo's opened a linky box here for anyone else who wants to show what's on their beds. Last Saturday for the Blues.. I did another pinwheel block in blues today. 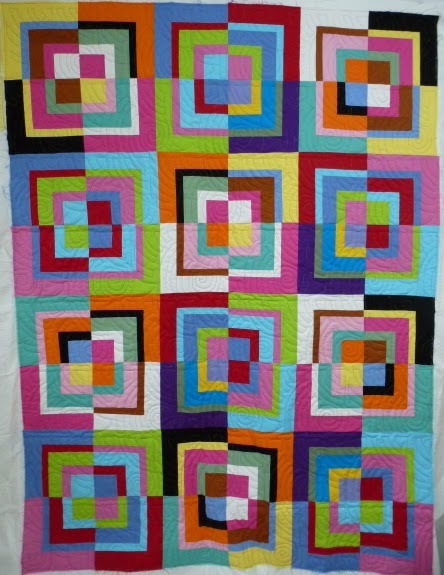 I am so really enjoying doing all of these different blocks for the Rainbow scrappy challenge. Why didn't I do this years ago? I hadn't actually expected to be able to get another one of these done today. I was supposed to be going to a quilt show planning committee meeting, but the meeting got cancelled due to the weather, so it was a free sewing and jammies day. I'm really excited and impatient to know what the colour for February will be? Will it be classic red for February? Here are all of my January blues blocks laid out together, eight 3 inch bow ties, nine 6 inch bow ties, nine triple four patch blocks, and the two pinwheel collection blocks. I'm linking up to SoScrappy for the last of the January blues. My Lazy Sunday Mystery quilt, designed by Bonnie Hunter and presented in 4 issues of Quiltmaker last spring and summer, is finished. Is it ever hard to get decent indoor pictures at this time of year. And at -13 C, there is no way I'm attempting outdoor photos, especially with the way the wind and the snow are blowing around out there. I'd be chasing the quilt around the neighbourhood if I tried it. The only place in the house that is big enough and light enough, is the front hallway. So I asked Matt if he minded if I came and borrowed his floor for a minute or two, which he was fine with, of course. Even then, it was a close fit. It's kinda hard to see the detail of the quilting, but it's an over all free hand swirl. Lots of fun to do, and lots of texture on the surface of the quilt. It's such a scrappy and busy quilt that anything else would have gotten lost on it. borders would have gotten chopped off. After all the work on all that piecing, there's no way I wanted to lose all those points. Again, this isn't a very good picture, but if you click on it, you should be able to see the striped binding with the pink insert for the piping. I'm linking up to Crazy Mom Quilts Finish it Friday, in order to celebrate this finish. I still have the Pinery sweater on my needles. It has grown some more, and is about 5 rows away from the body of the sweater being done. Then I can move on to doing the neckline and the sleeves. I still love it. This has been a thoroughly enjoyable knit, and I'm so excited that it getting closer to being done. Tonight should see the cast off of the body of the sweater, and I can try it on and see how it looks, so far. I'm linking up to Judy's On the Needles. There are lots of other knitting projects to see over there. Always full of inspiration, and sometimes more than a little temptation for further projects. Well, my well laid plan from Monday didn't survive. But I have a good reason for it, really I do. It's this quilt, pictured to the right here. It's my Lazy Sunday quilt, Bonnie Hunter's mystery from Quiltmaker magazine last summer. It came off the machine on Monday, and got really pushy. You know how these things can get, demanding to get their bindings made and put on right away, rather than get put aside and forgotten. I decided to listen to it, and do what it wanted, because otherwise it would have gotten put aside and forgotten. It has 2 1/2 sides finished now, but my shoulders started to give out on me, so I'll finish it tomorrow. My Three of a Kind, from Judy Martin's book Scraps has grown by one block since Monday. It now counts as half done, before doing the borders, with 18 out of 36 blocks done. It is going to get set aside, for now, while I concentrate on finishing my January UFO. It's coming up to the end of the month, so it's time to move it to priority status. 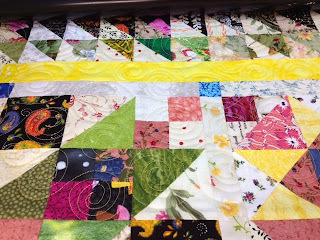 It would be cool to be able to join some of the Friday finish parties with a fully finished quilt, and a finished flimsy. 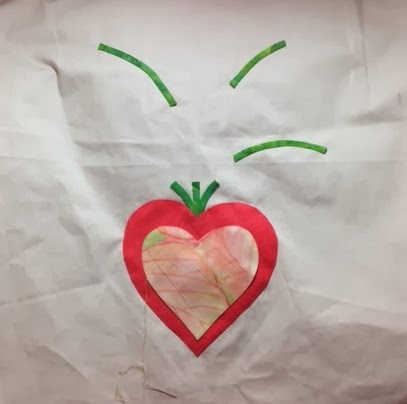 Right now, I'm going to link up to a Canadian group, which I found through someone else's blog a couple of weeks ago, called The Needle and Thread Network. It's been fun reading though some Canadian blogs today. I loaded another customer quilt today. It is one of the many quilts that I get that simply make this job so much fun. I don't very often get the chance to do a quilt using bright orange thread, but this one simply demanded that colour, and I was very happy to agree with it. There are so many other fun fabrics in this one. 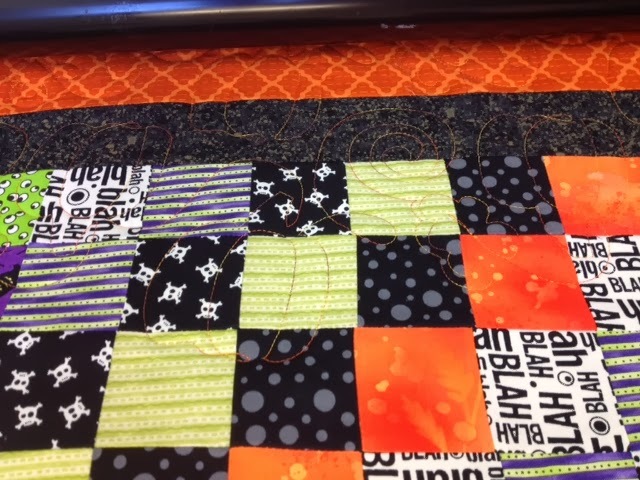 It's being quilted in a pumpkin vine pantograph. I'm resting my legs, at the moment, and making myself a cup of tea for a bit of a break, and then I'm going back to work on this some more. Every time I look at it, it makes my smile and giggle. I love my job! I still have Three of a Kind, on my wall. I think it's increased in size by 2 blocks since this time last week. Other commitments in the past week took away from sewing time. That, and getting carried away with the knitting, since I was, and still am, getting very excited about the way my sweater is looking. I just couldn't stop. One more block on this, though, and they will be half done. What I really have to concentrate on for the next 10 days is getting this month's UFO done. Two borders on it are done, two more to go. I did get the quilting on my Lazy Sunday Mystery finished today. It is off the machine and trimmed and waiting for binding to be made. I'll get a picture of it when it is done. I'm linking up to Judy's Design Wall Monday, and then, I think I'll figure out something to eat, and then see if I can get a couple more of these blocks sewn up. Oh, wait, I said I was going to work on the UFO, didn't I? OK, here's what I'm gonna do - this one today, UFO tomorrow, this one Wednesday, UFO Thursday, that way each one gets even time. At least, that's my story and I'm sticking to it.... nothing to do with procrastination..... not a thing. I've been doing lots of slow, relaxing hand stitching today. There was a workshop held by the guild yesterday, featuring Jill Buckley of The Quilt Rat. She assisted us with a wool on cotton wall hanging design. I must confess to initially, at least, having a hard time with it. No matter what I tried to do, as far as embellishing stitches went, I couldn't get it to look the way I wanted. I spent more time ripping stitches out than putting them in. I really enjoyed the workshop, and it was a fun day getting together with lots of fun people, but there was no way this thing was going to do anything for me. So, I came home yesterday, and set it aside until I could look at it with fresh eyes. I picked it back up again this afternoon, and it suddenly started coming together. I don't know what the problem was yesterday, but I like it a lot better today. There are some additional pieces to go on in between the flower petals, and then some additional circles to go on over to the side of the flower. It will eventually end up as a wall hanging. I also got some work done today on the next My Tweets block, number 9. All of the stems are stitched down. The large heart is stitched and half of the small one is done. All in all, not too bad a day's relaxation. As far as the stash usage goes, that's looking up. I got one of my own quilts loaded on the machine on Thursday, so that took up over six yards of fabric for the backing. It will be done early this coming week, so there will be more fabric out for the binding. Balance: 10 more yards out than in. Yeehaw!! I'm still in the black. I had no idea there would be such a feeling of accomplishment produced by that. I'm linking up to Scraphappy Saturday, where there are lots of other people playing the blues. I loaded my Lazy Sunday quilt, which was a mystery in the Quiltmaker magazine last spring and summer, designed by Bonnie Hunter. I had all kinds of plans for this quilt. I purchased a new pantograph that I thought would look fabulous on it. I got the pantograph all printed out and taped together, and then ran into a snag. The pantograph turned out not to be straight... my error, not the panto's. And then, once this quilt was on the frame, it told me, in no uncertain terms, that it didn't want a pantograph done on it. It didn't want anything fancy, just lots and lots of texture. Far be it from me to argue with a quilt, so that's what it's getting. I'm doing free hand swirls, fairly densely. It's a really happy, busy quilt, as Bonnie Hunter quilts tend to be, and it seemed like dense quilting, in scale with all the piecing, was what it wanted. I've done 2 passes and gone through 2 bobbins, already. I'm keeping the bobbins in one place for this one, as they are emptied, just to keep track, out of curiosity, how many it takes to do this quilt. I have a meeting tonight, so this is as far as it is getting today. It just might get finished tomorrow, which would be fabulous. I've been back at working at long arm quilting since the beginning of last week, after taking a 2 week break over the Christmas and New year holidays. I've finished up three for Amalia. First was a wall hanging based on the One Block Wonder. She used a very delicate print for her blocks, and I love the way they look. The movement in the blocks is visible, and yet quite subtle. I quilted it with an overall free hand swirl with feathers around the outside of the swirls. There are feathered swirls also in the borders. And the geometric blocks have various straight lines quilted into them, to accentuate their shapes. I love the depth these geometric boxes give to the quilt. The shading and shadows in the top box are fabulous. It has quite a modern feel to it, so I thought some modern quilting would be appropriate for it. I used a pantograph called Modern Bricks. I like the way the quilting design incorporates a Baptist Fan feel to it, with some swirls thrown in. I'm going to try and be more faithful about posting the customer quilts I do this year. I'm thinking of Wednesdays as a good day to loosely plan for this. I'm a little late posting today. I had meant to earlier, but then got involved in knitting and watching movies, and lost all track of time. I have Three of a Kind still on my wall, a pattern by Judy Martin, from her book Scraps. I'm up to 15 blocks now, out of the 36 that I need. I got quite a few cut out tonight, but, due to the knitting and the movies, didn't get any further. However, my sweater got a lot done, so, tomorrow I'll spend more time sewing than knitting. I'm linking up to Patchwork Times Design Wall Monday, after which, I'm going back to my knitting. Here it is again. The My Tweets block number 8. The only things left to stitch down on this one are the three yellow flower centers up on the top left. I will be finishing these up this afternoon, and then I can start on the next block. Depending on how much longer it takes to stitch those down, I might get the pattern pages for block nine taped together, and maybe the bias stems ready to start. I think I am going to approach the next block a little differently. My usual habit has been to prepare all the shapes and glue baste them down, before starting any of the stitching. This time I think I'll take it slower than that. It might make the task a little less overwhelming. I'll try it, anyway. It might give me a bit more of a boost to be able to more clearly see the progress on the block, as different elements are added. I'm finding it helpful, so far this year, to have kind of a loose schedule for doing things at a certain time, in this case, choosing to spend a certain amount of time on Sunday afternoons peacefully hand stitching. It is soothing and relaxing, and gives momentum to a long standing project that I really want to get done, since it has been on the go since the end of 2010.... yikes!! My stash has seen a little more reduction, slowly working on various blocks and projects, and no additions. That might change by the end of the month, since there is a background fabric that I need for a new project. 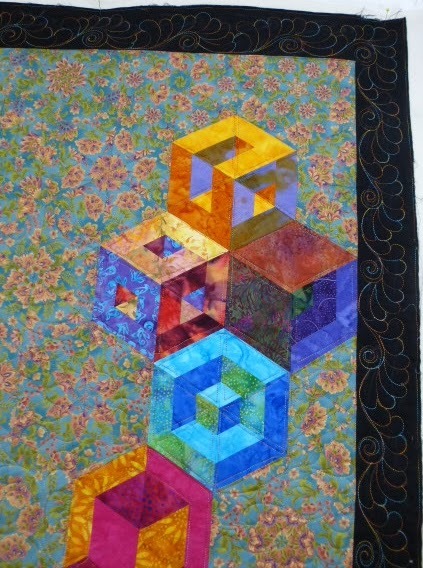 I'm not sure if I've mentioned this one before, but it's a block of the month, being posted by Mad About Patchwork, called Cathy's Carousel, not named after me, but the designer, named Cathy Price, who designs blocks of the month for her guild, the Lanark County Quilters' Guild. It actually started 3 months ago, but I've printed off the instructions, so I won't lose them.The original plan was that Gail, who blogs as The Cozy Quilter, and I were going to work on it together, at the same time. 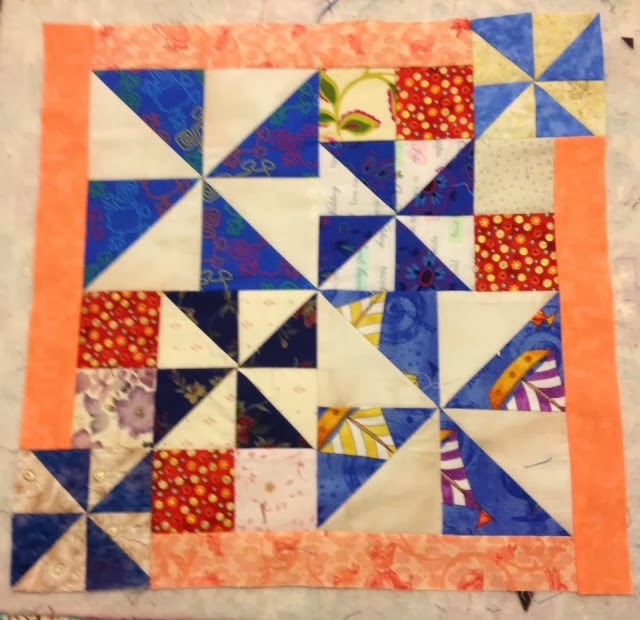 However, I got a bit impatient, and really wanted to get started on it..... there's that startitis flaring up again...... so I started it yesterday during my sewing afternoon with Gail and Karen and Christine, over at Gail's house yesterday afternoon. There are quite a few more strips to be added to the braid yet, but it is started. I think it might get set aside in its own little box, and become my take to Gail's project for the next undetermined period of time. Balance: 3.4 more yards out than in. I have this week's group of Scrappy blue bow ties done. There are nine 6 inch blocks. And there are nine 3 inch blocks. And seven out of eight of the triple four patch blocks are done. One more of these, and then I can work on the pinwheel block. I'm devoting one weekend each month to each of these different sets of blocks. I think that makes it manageable, and maybe I'll be able to keep up. It certainly didn't take long to sew up those bow ties up there. I'm heading out to Gail's Saturday afternoon, for a sewing afternoon. I'll take the last of the triple four patch blocks with me to finish up. But before we sew, we're going to check out a yarn shop. I might be coming home with a bit more yarn. I just might also be coming home with a BOM that we both really like started, which will make for another new project started. I'm taking my fabric pulls for it with me, so that's what I'll be working on. I'm linking to Scraphappy Saturday. Lots of fun stuff to see there today. looking kinda small. But that might be because it's all bunched up on the circular needle. I took a tape measure last night, and roughly measured around the bust, and it measures OK. I am loving the way the cables are looking. I've been setting aside an hour or two every evening to work on this. I'm enjoying the knit, the pattern, and the feel of the wool. I am looking forward to it being done, and being able to wear it. If it doesn't fit, then it is, after all, only yarn, and it can be taken apart and used for something else, although that would be horribly discouraging after all the hours I've put into it. I did do a tension swatch when I started, but I didn't block out the tension swatch to see how much give it had. I'll know better next time. I'm relatively new, not to knitting, but knitting with anything other than inexpensive acrylic yarns, which I've never blocked before. So, this is a learning curve. Actually, now that I think of it, I could always knit a test swatch from my next ball of yarn, and block that, and see what happens. Yep, that's what I'm gonna do, and then I'll know, before I go too much further on this. I'm linking up to Judy's On the Needles. There's lots of other lovely, tempting, inspiring projects over there. Looking at them all is how I get myself into trouble, with too many projects, but it sure is a lot of fun. Here it is, the first Monday of the New Year, and I have a new project up on the wall. This is my celebrate the New Year by starting something new project. 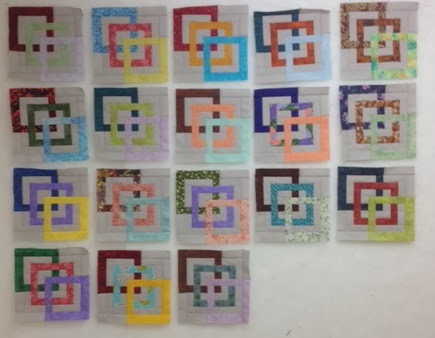 These are the first ten blocks of Three of a Kind, a pattern from Judy Martin's book Scraps, and it is indeed using up scraps, lots and lots of 1 1/2 inch strip scraps. Anything that is 22 inches long, or has enough to get a combined amount of that amount, can go into this one. I'm not grouping colour families, or anything like that in these. I'm just looking for contrast, with the darkest fabric at the back of the block to give some depth to the illusion of the quilt, with the colours crossing behind each other. I'm using Kona Ash as the background, and I really like how it it acting as a showcase for the rest of the colours. These are easy blocks to sew together, once I have them laid out on a design board beside my chair, so that I can pick them up and sew them in the correct order. The plan is to continue with this until it is finished, rather than letting it get to an Unfinished Object. I'm working on my UFO of the month, at the same time as this. The UFO that I chose for this month is my Thanksgiving quilt, also a pattern by Judy Martin. I still have leaves to finish for the borders, and I'm using the leaf pieces as leaders and enders for the Three of a Kind blocks. 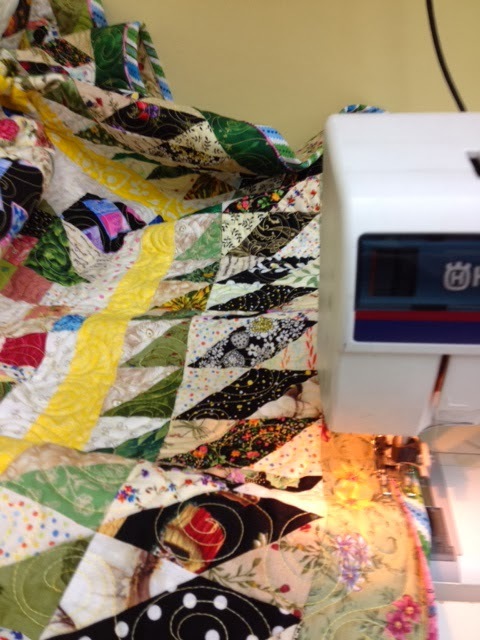 A great way to work on 2 quilts at the same time. I'm linking up to Design Wall Monday where there are lots and lots of fun, inspirational, tempting projects on other design walls to see. I am going to stick to my goal of finishing before starting, but it sure is going to be hard. Here we are, a brand new year, and as many have said, the slate is wiped clean, as far as the stash is concerned. This is my fourth year keeping track, and the first time in those years that I haven't had a huge influx of fabric due to year end sales. I am actually starting off the year with more fabric used than added, because nothing has been added. I didn't expect it to feel this good. I'm changing how I count, just a little bit. I used to count fabric as used once it was cut for a project. But I have discovered that I sometimes have fabric left over at the end of a project that will have to be added back in. So, I am going to count as blocks are made, for the most part. And it's easy to figure out the amount used, just by figuring out the square inches of the individual block units, and then multiplying it out. Most of the above use was for the Three of a Kind blocks. Each block uses 4.2 inches, so it's really easy to figure out, as I make blocks, how much fabric is used. I'll do the same for the rest of my projects, whenever possible. I've also decided that this is the year I want to get My Tweets finished, and spend some time doing the hand stitching for it. I'd been procrastinating on this one, which is block 8 out of 12, because I was at the stage of needing to do the tiny top knots for the birds, and the circles for the flower centers, neither of which are exactly my favourite part of this process. Well, today was the day. I got as far on the hand stitching as I could get without those things being done. So, I spent a couple of hours preparing those shapes and getting them glue basted on. And here she is, ready to be finished. Another hour or two should do it, and then I can start block nine. I'm linking up to Judy's Stash Report and Kathy's Slow Sunday Stitching. Lots of fun stuff to read and look at in both places. I was cutting from fat quarters, rather than scraps. And then, because I already had the fat quarter out, I continued to cut it down into various strip sizes. That created the situation that, instead of using scraps, I was actually adding to them. So, I have picked 2 more projects that will last at least all year long, to actually use the scraps. One is a quilt from one of my books that I've been eying as long as I've had the book. It will use 3 1/2 inch squares and 2 inch squares. It will end up being a bow tie medallion. This is from the book Quick Quilts From Your Scrap Bag. I've figured out that, if I do it in the year of different colours, I'll need 13 of the 6 inch bow ties and 10 of the 3 inch bow ties per month. And the other is going to be 3 different sizes of pinwheels, which will use up 3 1/2, 21/2 and 2 inch scrap strips, when cutting with the Easy Angle ruler. And then, inspired by Cat Patches scrappy sewing machines, and her idea of using the complementary colours for her accents, I'll use the complementary colour for the outer strips and the dark squares. These will finish at 14 inches. Thirty of them will give me a decent sized quilt. This is just a mock up from EQ7. The blues will be much more varied in the actual piece. I think once all the different colours are done, and set side by side, it will be quite striking. So, after making those decisions, all I now need to decide is, one project per week, or little bits of each per week? Right now, I'm leaning towards one per week. It might be less confusing that way. I'm linking up to ScrapHappy Saturday, and then I'm going to play with some more bright blues. I'm back to working on my Pinery Sweater. I am really enjoying this particular project. The yarn is Malabrigo Worsted, and the colour in this picture is pretty much bang on for accuracy. What it doesn't show, though, is the occasional splash of a subtle pink in with the rust. I am really liking the way the cables are forming. This is a top down knit. There will be ribbing on the top, once it is done, which will help the beginning of the cables lay a little bit better. Right now, they keep curling to the front. I think I'm one round away from splitting off the arms, at which point it should start to go much faster. 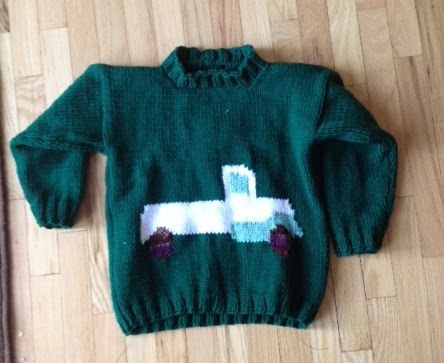 I just realized that I didn't show a picture of the finished Truck Sweater that I did for Avery for Christmas. I didn't manage to get a picture of him wearing it, though, so I'm not sure if it fit. I modified the truck design in the pattern considerably, in order to make it easier, and also because his Daddy has a white pick up truck. I actually didn't get this finished until 30 minutes before they got here. I sewed it up the day before, but still had to do the ribbing around the neck. That's what I get for procrastinating. LOL! I'm linking up with Judy's On the Needles. I've decided this year that I need to get back into setting some goals for myself for getting some projects finished. I have more UFO's around here than I care to count, and I really don't want to know just how many there really are. 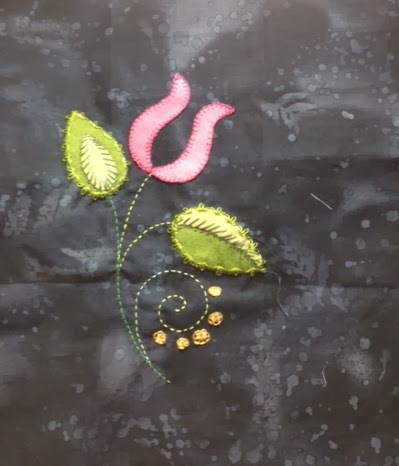 I've listed 10 on my side bar that I would like to get finished, at least to the flimsy stage, this year, and hopefully to the quilted and bound stage. I am finding that, as a long arm quilter for other people, my own projects get shunted to the side. So, this year, I am going to actually book in my own quilts. I'm going to make a loose schedule of which quilts get done when, and add my own in. For January, my finish it goal is this poor neglected quilt. It is a Judy Martin design called Thanksgiving, from her book Patchwork Among Friends. It has been hanging like this on my design wall since the November sew-in day for the guild. 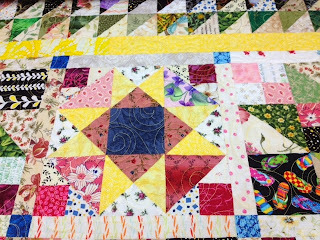 I would like to get this quilt finished to at least the flimsy stage by the end of the month. There are 60 more leaf blocks needed to finish the borders. I think I have about 20 of them done, so getting it to the flimsy stage is do-able. And I did make my goal of starting a new project for the new year, a January Newfo. These are the first five blocks for the quilt Three of a Kind, a pattern by Judy Martin in her book Scraps. This is actually the third quilt I've started from this book. One of them is finished, the other is on my UFO list for finishing this year. I'm going to continue on this for the rest of today, using parts of the leaf blocks as leaders and enders when needed. I think I am going to set myself another goal, that before I start another Newfo, I finish the first one I started. The exception to that is going to be in the Soscrappy rainbow scrap challenge I'm thinking of adding a couple more scrap using projects that get done a bit at a time, in order to meet another of my goals for this year, which is using up my overflowing boxes of scraps. I started last year on these blocks and I am going to continue with these blocks. But they end up not really using scraps, but have to be cut from fat quarters. So, I think I am going to do some churn dash blocks, that will finish at 6 inches, and some bow tie blocks in 2 sizes, 3 inch finished and six inch finished. I've seen a couple of quilts made from these units in one of my books, and doing them just a few at a time, shouldn't be that bad. I still have to figure out how many of each colour I will need in order to end the year with finished tops. And that's it.... my goals for this month, and the coming year. I'm linking up to the goal setting party for A Lovely Year of Finishes. I'm hoping this will give me the added oomph I need to get this done.